(Gallatin County, Mont.) Sunday two rescues sent Sheriff’s Search and Rescue Deputies and volunteers to Hyalite and Portal Creek simultaneously. At 4:00 in the afternoon a report of a 67 year old having heart trouble on the Blackmore trail in Hyalite Canyon was recieved. Because heart problems can be lethal a medical helicopter was dispatched to the area as well as SAR ground teams. 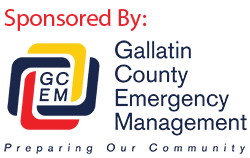 The Backcountry topography and weather in Gallatin County often prevents even helicopters from being able to reach people in distress so ground rescuers are always sent and often arrive before the helicopter. In this case weather was an issue and the Reach Air Medical Helicopter had to stand off and wait for an opening in the weather. Eventually they were able to land and transport him to Bozeman Health where his condition was reported as stable. At about the same time Sheriff’s Deputies and Sheriff’s Search and Rescue Volunteers at Big Sky were sent to a 77 year old man with a broken ankle on the Hidden Lakes trail at Portal Creek. When rescuers reached the trail head they found that other hikers had assisted him down the trail to the road. He declined an ambulance and traveled with family members to the hospital. In both cases there was no phone service available and someone had to walk out and report the incident. These delays can means hours between when the injury occurs and when help can arrive. Sheriff Gootkin said “Bad things can happen to people doing all the right things, so when out being active it is important to have a few things to help you survive. Carry something to stay dry and warm, something to stop bleeding, something to drink and eat and go with a partner.” Gallatin County Sheriff’s Deputies and Volunteers are also continuing to assist with the search of the Yellowstone River for James Anderson. This entry was posted in Media Release, Social Media Distribution. Bookmark the permalink.